What was it that Jim McKay used to say on ABC’s Wide World of Sports? Something about the thrill of victory, the agony of defeat. The Rye Country Day Wildcats know what he was talking about after a crazy MLK holiday weekend. 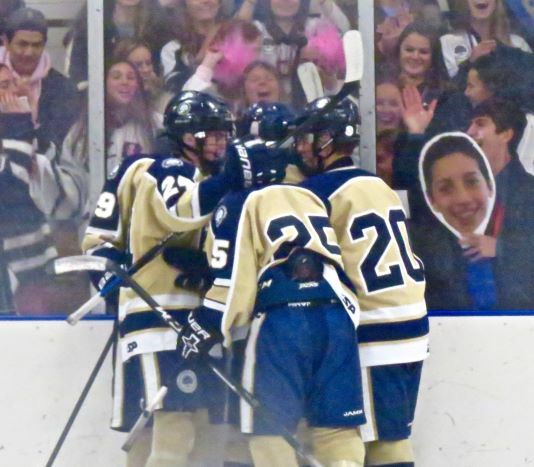 They won a huge rivalry game at home Friday and then lost a heartbreaker two days later in OT against Suffern, Section 1’s most dominant team. The weekend began with Head Coach Brett Farson’s crew taking on cross-city rival Rye High in front of the biggest home crowd of the year. While it’s a down year for the 3-9-1 Garnets, everybody gets up for these neighborhood matchups. And with everyone cheering for “Rye,” it got a little confusing as well. Still, when the Wildcats went up early on a couple of scores by senior winger Josh Cohen, set up by fellow co-captain and winger Jack Kissell, it was only natural that the Garnets would come back to tie on goals by Danny Fitzgibbons and Sasha Vasyuta. Halfway through the second period, the Kissell-Cohen combo struck again with another one-two punch. Cohen held the puck in the corner, drawing the defense to him, before zipping a pass to Kissell, who was standing on the doorstep for a tap-in. Half a minute later, Kissell found Cohen in the slot. Score: 4-2. But the Garnets weren’t going down without a fight, and Vasyuta scored his second goal of the game. Then Kissell pounced on a Rye High turnover with a minute left in the period to restore the two-goal difference, 5-3. The third and final stanza was a hard-hitting, furious up-and-down affair with several 3-on-2 breaks for each side. 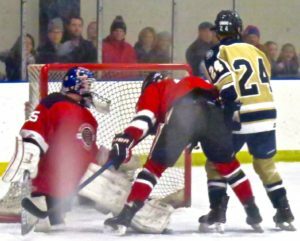 But neither goalie gave an inch: Patrick Myers had 23 saves for the visitors while ninth-grader Ian Tumm stopped 23 shots for the Wildcats. They didn’t have to. Junior defenseman Will Massaro won the puck with under a minute to go in the game and sent one sailing from his own face-off circle toward the Garnets’ cage. It missed by an inch, clanging off the post. Forty seconds later, it was déjà vu all over again, as Yogi Berra once said. Massaro had the puck on his stick, took aim, and sent a 90-foot shot toward Rye’s still-undefended net. This time, it nestled in the twine. Final score: Wildcats 6, Garnets 3. If the locals played a good game against Rye, they played a great one Monday evening against Suffern on the Mounties’ Sport-O-Rama ice across the river in Monsey. After falling a couple of goals behind, that ice began to tilt in the Wildcats’ favor. Sophomore center Charlie Keating made it 2-1 when he cleaned up a rebound with under a minute to play in the opening period. He scored again with six minutes gone in the second, and then junior Liam McLane gave the Wildcats a 3-2 edge five and a half minutes later. Suffern’s Max Werfel netted the equalizer with 11:21 to go in the third. The score stayed that way to the end of regulation and all but the final 29 seconds of overtime. This is where we yield the floor to our good friends from The Journal News and the video they grabbed of the game’s turning point. aha!…the ref closest to the play called it interference on Rye Country Day, and awarded Foresta a penalty shot. Which he converted. Final score: Suffern 4, Wildcats 3. This reporter has been a hockey fan since the bad old days when Nedicks sponsored the Rangers. Translation for young fans: A long time. That penalty shot was the most ridiculous call I’ve ever seen. Expect the Wildcats to play full throttle Friday at home against King. Puck drops at 4:45 p.m.